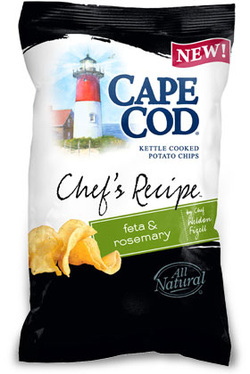 Cape Cod's standard Kettle Chips bags are among the world's finest designs, with each one earning five stars on our review pages. The broad black colors of this special edition flavor doesn't work nearly as well. The color coded pack designs work really brilliantly, but as a 'New' option the Manufacturer clearly wanted these bags to stand out - they do, but the black overwhelms the design - they could have tried two colours. Perhaps it was because these Chips were loaded with flavor and seasoning, but they did not crunch quite as well as most of Cape Cod's Chips. However, as with all Kettle Cooked Chips you do get a superior crunch to regular Chips and the Snap Test provided us with a few good, solid Chips that broke in half without crumbling to pieces. A high quantity of green flecks were found liberally coating these thick Kettle Cooked Chips. There was a fair amount of characterful seasoning powder on these sometimes curly, sometimes small, bubbled Chips. It is a little difficult to work out how the process would work. You get a chef and ask him or her for their most amazing Chips recipe, or do you just ask them what flavor they think would make a good Chip? After all, it is a stretch of the imagination to consider that a restaurant chef will know that you will need whey protein concentrate and gum acacia to make a great tasting Feta & Rosemary Chip. It all seems like a little bit of marketing nonsense really. So, we will concentrate on the Chef's Recipe (sic), and say it is great! A really good combo of cheese and herbs. Although, admittedly Cheese & Herbs Flavor would not sound quite as impressive.